Hello beautiful ladies! I am back after a hectic time with Ganesh Chaturthi celebrations at home. I had a blast with all the family members and really enjoyed the yummy Modak prepared at home. I even gained a few calories in these festive days. With so many festivals coming up and family gatherings around, it is important to look good. There is this competition kind of thing going around as whose daughter looks the prettiest amongst the family members. Looking good also means having a good hair day. This is possible by taking good care of hair with regular oiling, shampooing, conditioning and using a good serum. I remember the word serum when it was coined around 4-5 years back with just two of them in the market- Silk and Shine serum and Livon Silky Potion. But today there are a wide varieties of serums from different brands. I used to use Silk and Shine serum during my school days. I had very less time to tame my frizzy hair with my school starting at 7 AM. It was a good serum but made my hair look dull. Then I tried Livon Silky Potion and it was better than Silk and Shine. Since then I have shifted to multiple brands of serums but when I received the Livon Silky Potion in my Diva Likes haul, I felt like my school days came back. Recently they have improved the formula and I was hoping it works on me. Take a look at the review to know more about it. • Livon Silky Potions unique Cutisoft Formula instantly smoothens and softens the hair cuticles, transforming your dry, rough and brittle hair into smooth, soft and silky hair. • Eases the tangles, knots and snarls in your hair and makes them 'easy to comb'. • Makes your unmanageable, frizzy hair easily manageable by straightening them and giving you a well groomed look. • Livon Silky Potion also contains Vitamin E that nourishes your hair. Cyclomethicone, Dimethiconol, Tocopheryl Acetate, Mineral Oil. Take an adequate quantity of Livon Silky Potion in your palm depending on the length and thickness of your hair. Apply it gently on your hair till each hair strand is covered from base to tip. Now touch your hair after combing. Feel the difference instantly. First and foremost thing I liked about this product is that they have mentioned the usage directions so elaborately. Some products don't even mention how to use it and this particular product has explained it well. Now coming to the packaging, Livon Silky Potion comes in a dark pink colored carton. Inside the carton, you find a cute tiny sleek bottle of the serum. It is made up of good quality hard plastic. 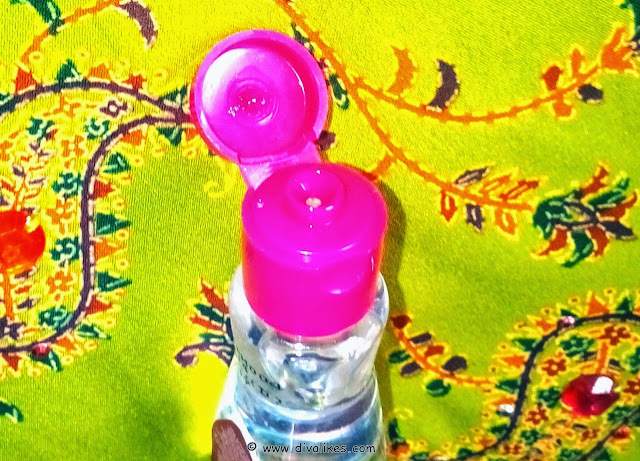 It has a dark pink colored flip flop cap with a small nozzle for dispensing the product. The nozzle is very small and hence will release only the required amount. So there is no product wastage. Overall the packaging is nice and sturdy and will fit even in the smallest of space. The serum is transparent with a very smooth fluid texture. It smells exactly like most of the other serums available in the market. I use it on towel dried semi-damp hair and mostly avoid using it on the scalp as I fear of product blockage in the hair roots. After application, my hair feels soft and smooth. It eases the tangles very well and makes them easy to comb. It makes it manageable also. The hair stays soft till my next hair wash. But it does not provide any shine to my hair. Also if you use more than the required amount, it can make your hair look oily. But it is better than my L'Oreal Paris Total Repair Five Hair Serum. Livon Silky Potion makes my frizzy hair appear smooth and helps control flyways. This contains vitamin E which is good for hair growth. I like this product and would surely suggest you to try it! Helps control flyways and tame frizziness. Eases the tangles and makes it easy to comb. Contains vitamin E which is good for hair growth. If used more than required, it can make hair appear oily. It is a nice serum which makes frizzy & dry hair manageable. It makes my hair soft without weighing it down. But if used more than needed, it can make your hair oily. For frizzy haired girls like me, this is indeed a good serum to control frizz and tame flyways. I recommend this to everybody. I used this sometime back and it made my hair look oily...not my favorite ! Maybe it worked bacause i have dry hair Lavs..
Thnx Salomi do give it a try..